Serissa foetida derives its name from the fetid smell of its bark and roots when they are crushed or cut. Foetida is literally 'foul-smelling' in Latin. (It should be noted that S.foetida is sometimes referred to by its old Latin name Serissa Japonica). Serissa is a genus of only one species (foetida), a small evergreen shrub up to only 50cm in height, from moist, open woodland in S.E. Asia. 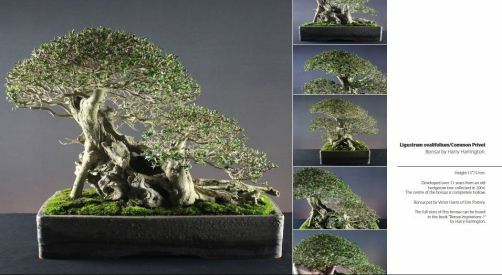 Its leaves are borne in opposite pairs and branches are produced in dense numbers from both old and new wood giving the tree good potential for bonsai cultivation. Serissa produce numerous small funnel shaped flowers during the summer (and at other times of the year in alien environments) hence its common name 'Tree of a thousand stars'. There are now quite a variety of forms of S. foetida in cultivation that carry variegated leaves with single or double flowers. Though very commonly found for sale at bonsai establishments throughout Britain and Europe, the Serissa is notorious for being hard to keep for both experienced hobbyists and beginners alike. The Serissa has a tendency to yellowing and dropping leaves if correct growing conditions are not kept. Being a subtropical species Serissa have to be protected from temperatures below 7°C which means indoor cultivation is required in most areas of Europe and America for a good proportion of the year. However, here lies the heart of the problem with this species; it is difficult to keep up the humidity levels required by Serissa in an indoor environment and this often causes the tree to suffer. Position Outside when day and night temperatures stay reliably above 7°C; in Britain this means from late May to mid-September. It is important for the health of the tree to spend at least a few weeks each year outside, however, ensure that the tree is not moved around too much once outside. Indoor cultivation; when temperatures threaten to dip below 7°C (day or night). Find a bright but not too sunny permanent position out of cold draughts, for instance on a East or West facing windowsill. Good humidity levels must be maintained and can be provided by the use of a humidity tray. Never place the tree on a windowsill above a radiator, (radiators/central heating are the primary reason that indoor cultivation is so difficult as they dry the air considerably) do not place the tree on a windowsill where the curtains are closed at night as this environment can experience very cold temperatures at night during the winter. Moving the tree to a new position will stress the tree until it acclimatizes, on occasions causing yellowing and dropping leaves- this should be followed within a few days by fresh growth. Watering Serissa strongly dislike continually wet roots though bone dry compost will also kill them. Water thoroughly (ensure your compost medium is well drained) and do not water again until the compost has NEARLY dried out. Daily watering as a routine should not be carried out unless necessary though daily check the soil daily. Ensure the gravel tray is kept continually wet but never allow the pot to be stood in water. Yellow leaves can often indicate overwatering (though this can also be due to other factors), brown and crispy leaves indicate lack of water or lack of humidity. Feeding Feed once a month during the winter (September to March) and every two weeks between March and September when growth is stronger. Only feed when the compost is already moist or the root-tips can be burnt. Do not feed when the tree has lost leaves or if it is not showing new growth. Repotting Serissa dislike rootpruning and can be left for 2-3 years at a time. Repot in Spring as growth starts -this helps the rootsystem recover quickly. Use a standard soil mix. Pruning Remove suckers unless required for multiple trunk styles. Prune back to one or two leaves to shape unless otherwise required. Propagation Softwood cuttings in Spring or Early Summer. Semi-ripe cuttings in late Summer. Rooting is aided with bottom heat. Pests and diseases Scale insects. Yellowing leaves and leaf-drop caused by incorrect placement, poor humidity levels or incorrect watering. Styles All forms except formal upright in extra-small to medium sizes.